This project details the results of usability testing conducted on specific tasks in The National Domestic Violence Hotline’s (NDVH) caller intake system, commonly referred to as the Caller App. The goals of the usability testing included establishing a baseline of user performance, establishing and validating user performance measures, and identifying navigation concerns to be addressed in order to improve the efficiency, productivity, and end-user satisfaction of NDVH staff. Survey a broad cross-section of staff to ensure a comprehensive assessment. Navigation errors – failure to locate functions, excessive keystrokes to complete a function, failure to follow recommended screen flow. Presentation errors – failure to locate and properly act upon desired information in screens, selection errors due to labeling ambiguities. Control usage problems – improper pick-list or entry field usage. Exercise the intake under controlled test conditions with representative users. Data will be used to assess whether usability goals regarding an effective, efficient, and well-received user interface have been achieved. Establish baseline user-performance and user-satisfaction levels of the user interface for future usability evaluations. The Caller App is a deployment of the Salesforce Service Cloud and is used primarily by NDVH call center agents (referred to internally as Advocates) for intake of basic information from callers, and to match callers to appropriate local resources. NDVH uses this software to provide services to approximately 30,000 callers a month, with 20% of those contacts being facilitated via digital channels and the balance coming through traditional phone lines. Following the initial deployment of the software in April 2015, NDVH management received many complaints from staff having trouble adapting to the new system. Subsequently, management undertook a process of updates to improve the usability of the system, and to establish a user feedback channel, in order to allow management to more easily identify additional necessary changes to both the usability and back-end data structure. Advocates were initially surveyed to solicit feedback on the current system, prior to suggesting changes or updates. This survey process provided valuable insights for the Technology team managing the update process, allowing the team to focus on target areas of the system, including the filtering mechanisms and map deployment. As such the team was able to develop an Axure prototype that allowed the team to test the planned updates. Following the survey, a test pool was created, including seven advocates from both chat and phone service provisions, for a convenience sample. Each participant completed one session (not in excess of one hour in length), on October 15. One team member facilitated the test and simultaneously took notes (in order to capture a large number of users). While participants navigated the Axure prototype Caller App they were asked to speak aloud as they completed the test questions. The testing activities focused on the sequence of actions to intake a caller form the Houston area, and how well they match up with ideal outcomes as designated by the team. NDVH and many victim service providers doing similar work are uniquely challenged due to the fact that, as confidential services, they are not allowed to bring in personally Identifiable information (PII) about their callers. NDVH’s decision to utilize Salesforce as their deployment of choice required extensive customization to mask and customize data to stay within privacy guidelines. As such, focus on user testing was somewhat lacking in the initial deployment, leading to a rocky initial adoption process. Additionally, NDVH had to move quickly to migrate off an old platform due to failing hardware. As a result, necessary back-end cleanup of the underlying data structure was not executed prior to launch. In the month following launch, NDVH issued several incremental updates to the system, while continuing to explore a more robust update that would be rolled out in the new calendar year in order to keep reporting systems in compliance. Each question also featured an option for open response, which proved useful in designing the prototype and testing protocol. The survey was completed by 61 advocates over the course of two weeks in September. 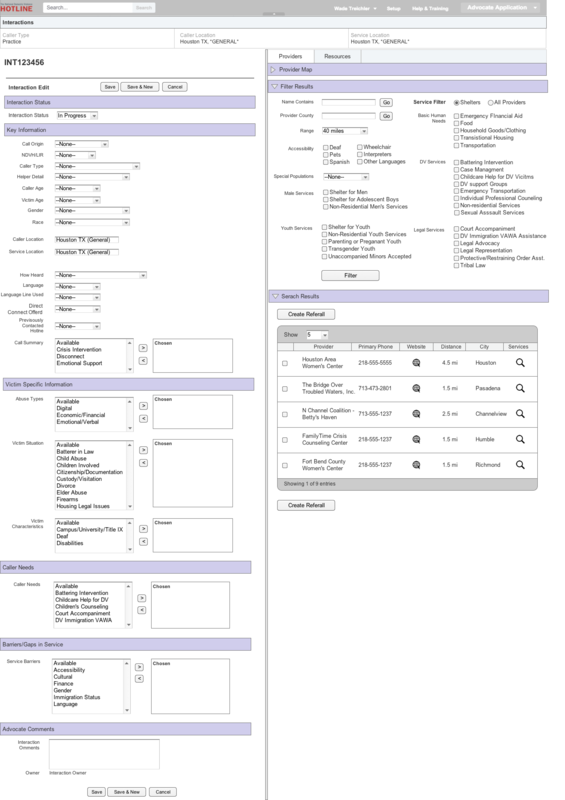 Using the results from this tool, the team was able to formalize a plan for realigning user interface and provide more filtering options. Interactions: Data from the past 6 months was used to identify gaps in data collection. Any field used inconsistently (or incorrectly) was then evaluated to determine whether whether training or technology could fix the issue. Caller Types Adjusted: Only 14 Caller Types are represented in the prototype, as opposed to the 24 options currently available. Caller Types now accurately reflect the profiles of those who contact NDVH. Fields and Options Updated: All fields were evaluated, but some were removed entirely from the Interaction. Additionally, some fields were rearranged to better capture caller / chatter narratives. For example, Victim Situations is now Victim Characteristics and Victim Situation. Search Options: Revamped search options allow Advocates to find the most appropriate Providers more quickly. For example, users will now be able to search by specific services offered, using checkboxes, as opposed to attaching Caller Needs. Caller Needs: To streamline the data-input process, Caller Needs will just be a field alongside all other caller / chatter information. This change will save time and strengthen the narrative. A test participant pool of seven subjects was tasked with recording an Interaction in the prototype, completing five distinct scenarios / test tasks based around a hypothetical caller form the Houston area (in order to populate the map section realistically), and were encouraged to speak aloud as they worked through each process. The test plan also included a subjective evaluation questionnaire, to be completed at the conclusion of the testing session, and captured by the tester in Survey Monkey. Task 1 Using what you know about the new interface, hide the map display of results. Click the collapsible pane for the map tool. Task 2 Using the filter tools, find provider results from Houston that supports Court Accompaniment for your caller. Check the court accompaniment option in the legal services section, and click Filter. Task 3 Using the filter tools, find provider results from Houston for providers that services specific to Muslim callers. Select the drop down from special populations, and select Muslim, then click Filter. Task 4 Open the website for Houston Area Women’s Center. Click the web-icon in the search results listing. Task 5 View the list of services offered by the Houston Area Women’s Center, and then create a referral. Click the View Services link the Results section. Click the left check box, and click Referral. For the purposes of this test, our team drew from both the survey results and informal feedback from call center managers with the goal of validating proposed changes (by utilizing the prototype) before handing the project over to the contract development team. View the list of services offered by the Houston Area Women’s Center, and then create a referral. Task completion was measured as the ability to conclude a task without encountering a critical error. It is worth noting that task three, which had the lowest completion rate, was always tested in the same order. It was the first encounter for users with the new interface, which could point to a possible learnability issue that should be corrected in subsequent testing by randomizing task order. Critical and non-critical errors will be captured by count. A non-critical error is an error that does not prevent successful completion of the scenario, but may have some false starts or off-target clicks. A critical error occurs when the user is unable to complete the task. The table below displays a summary of the test data. Low completion rates and satisfaction ratings, as well as high errors or longer time spent on tasks, are indicated in the table below. Participants provided ongoing feedback as they completed each task, as well as any task completion questions that arose. Their comments, along with the task completion and errors data, form the basis for our recommendations. Do you prefer the initial view of the map collapsed or expanded? Open-entry feedback: Feedback supported keeping the map expanded, perhaps without the option of collapsing. One advocate expressed that she feels “more connected with the caller” when she has the location readily available, and provided very positive feedback about the map experience overall. Open-entry feedback: One participant expressed that titles / headers could be larger, or formatted in a way so that they’re easier to read. Another said, “Wow, that’s great” and added that the additional filtering options helped her visualize what could be offered to the caller. Other participants had positive overall reactions in terms of ease-of-use and improved filtering options. Open-entry feedback: Overall feedback was positive. However, one participant said she felt it was the same usefulness as current layout. Small changes that could improve the usability of the system the existing deployment. Language clarifications that could help direct users to the ideal outcomes. The severity rating below is based on two factors: impact and frequency. Hotline advocates, due to ergonomic limitations in the current workspace, have relatively small monitors and as such had requested an overall condensing of the user interface. Further inquiry, however, lead the team to the conclusion that the deployed or expanded map (at the sacrifice of pixel real estate) was preferred by most staff. Improve Section indicators in Filter options Hotline advocates, due to ergonomic limitations in the current workspace, have relatively small monitors and as such had requested an overall condensing of the user interface. The initial deployment of the Caller App featured two ‘Go’ buttons placed directly to the right of two primary free-entry search fields related to country and program name. While the new deployment retains these fields, the ‘Go’ buttons were widely decried in the open feedback segment of user testing as being confusing and, ‘unclear as to what they actually go to.’ It is recommended that these be combined into Filter / Clear Search buttons in the summary section of the Filter section. Issue definitions for each data point Throughout the process of both the interface testing and the data cleanup, it became increasingly clear that Advocates lacked clear definitions around the data points in the Caller App. While not entirely a usability issue, it had clear implications regarding the overall data integrity of the platform. Due to the privacy and confidentiality restrictions of the service provided by the platform, very little pre-populated date can be consumed by any system, so is falls to the Advocate to act as the primary interpretation point. As such, it is critical that they have clear definitions for likely scenarios and receive adequate training on said definitions. As a testing group, NDVH Advocates found the interaction changes and information architecture updates to be a positive change in the existing deployment. Testing results indicate that NDVH should proceed with its planned changes, while also taking into account key recommendations. From a broader perspective, trainings or the lack thereof seem to be a broader problem in the overall issue of system adoption. Across the board, advocates seemed confused regarding definitions, appropriate call-flow, and the vague purpose of the Caller Need section as a filter mechanism, as well as a narrative device for reporting purposes. The lack of appropriate training, the mismatch of workflow with regards to actual call-flow, and the rushed adoption of a new system (due to impending hardware failure), without regard to the necessities of data integrity or cleanup, have all contributed to a less than ideal adoption path for NDVH on a system that is not only integral to operational stability, but also critical for future reporting and issue advocacy. That said, these system updates, in both interface and data structure, should improve Advocate efficiency on the front lines and improve the quality of reportable data.